El quinto elemento. Como ya vimos con el Nexus 4, Google ha ofrecido un reto a precio competitivo al resto fabricantes de smartphones. El actual buque insignia del hardware pone a sus competidores directos bajo una gran presión, ya que el Nexus 5 ofrece hardware extremadamente potente y el mas reciente sistema operativo de Google - Android KitKat. 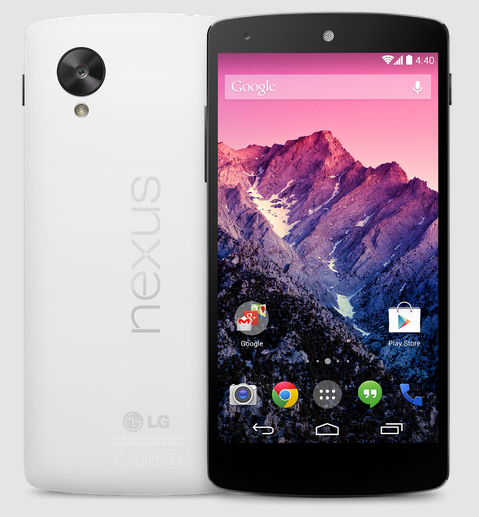 The Nexus 5 is the pound-for-pound the best value handset available on the market. It delivers excellent performance and has a vibrant full HD display but is not perfect. LG has understandable had to cut costs in the camera department and there's no way to expand physical storage. If you're reading this review and thinking about getting a Nexus 5 then hold your horses. Google has just announced the Nexus 6 (alongside the Nexus 9 and Nexus Player) as its successor. It's made by Motorola and is very similar to the Moto X 2014. However, it's not necessarily a natural upgrade, mainly because it's got a huge 5.9in screen and is supposedly going to cost a lot more than the Nexus 5. We're waiting for a price. See what's changed in our Nexus 5 vs Nexus 6 comparison. If you love Android and want to experience it as Google intended, free from bloatware and custom skins, then this is certainly the handset for you. It’s not perfect by any means, but one of its downsides – the camera – can be fixed, which just leaves the battery, but as we all already know: poor battery life isn’t exclusive to the Nexus 5 – it affects almost all top-flight handsets (excluding a very select few devices). The current Nexus phones never aimed to be the top of the line, but were rather trying to give a pleasant user experience by offering affordable prices. Now LG and Google have outdone themselves with Nexus 5 and presented us with a device which stands shoulder to shoulder with models such as G2, Galaxy S4, Xperia Z1 or HTC One. Having won six rounds to the Nexus 5's two, the Galaxy S5 is the clear winner. Featuring a more robust design, superior performance, better camera and clearer display, the Galaxy S5 outperforms the Nexus 5 in almost every way. However, with the Nexus 5 already halfway through its lifecycle as a flagship smartphone and costing close to half the price of the Galaxy S5, the Google handset does present far better value for money and is still a solid choice for any buyer on a budget. HTC One M8 vs Google Nexus 5 comparison review: which is the best Android smartphone? As we noted when we originally reviewed the Nexus 5, it has the specifications to rival flagship Android phones, but at a much lower price. For a shade under £300, you get a great smartphone with only a few compromises. One is the plastic body, another is the lack of expandable storage. The HTC One M8 may have an aluminium shell (and a choice of three colours) and feel much more like a premium phone, but you'll also pay for the privilege: £550 if you buy it outright with no contract. Having won four rounds to the Nexus 5's three, the Sony Xperia Z1 Compact is the clear winner. Featuring a better camera, superior performance and a more rugged design, the Xperia Z1 Compact is one of the best phones currently available. But with the Nexus 5 costing a massive £150 less than the Xperia Z1 Compact and offering more than reasonable performance, the Google phone does offer buyers better value for money. The Nexus 5 is a superb smartphone: we like the design; it’s as powerful as they come; the screen is great; it runs the latest version of Android; and the camera – although a weak point – is capable of producing good snaps and video if you’re patient. It’s the price, however, that swings things in favour of this Android handset. At $399 for the 16GB version, and $449 for the 32GB one, it undercuts its rivals significantly. That, coupled with its all-round capabilities, help to push the Nexus 5 to the top of the PC&TA A-List. Nexus 5 vs Moto X comparison review: Which Google Android smartphone should you buy? If you can't afford smartphones like the HTC One, Sony Xperia Z1 or Nokia Lumia 1520 then the Nexus 5 and Moto X are two great alternatives. The devices have decent spec but without a premium price tag. The Nexus 5 is a screaming deal. The Google Play Editions of the Samsung Galaxy S4 and the HTC One are no longer easy to recommend, because they cost $300 and $250 more, respectively; while they're both getting Android 4.4 KitKat very soon, they're still much more expensive, and the Nexus 5 neatly splits the size difference between the HTC One's smaller display and the Galaxy S4's wider and more difficult to hold form factor. The Nexus 5 has a faster GPU than both of them as well. But in the end, it's Nexus 5's subsidized price that's impossible to beat. The Google Nexus 5 is available on the Play Store for Rs 28,990 for the 16GB model and Rs 32,990 for the 32GB model. At these prices, it’s hands-down the best value-for-money, flagship droid you’ll ever find and even more so if you can source one from the US. But is it the best Android smartphone? Definitely not. The Sony Xperia Z1, LG G2 and even the Samsung Galaxy S4 are much better Android smartphones as they offer more features and better performance right out the box. If you’re only looking for the best Android experience and timely updates are of utmost importance to you, then look no further than the Nexus 5. All said and done, if you want a smartphone that is well built, has the latest specifications and runs apps well, then the Nexus 5 is the smartphone for you. If the camera is a high priority or you want a smartphone that's perched at the cutting edge of chic, we think you should look elsewhere (for instance, at the HTC One or the Xperia Z1). LG has made a great flagship smartphone for Google in the Nexus 5, and even if it isn't perfect, it makes a damn good attempt at perfection. This is without a doubt one of the best phones on the market in terms of value for money. With a €349 ($349 US) to €399 ($399 US) price depending on the region, it is a very attractive package at a fair price. Pitted against the LG G2, HTC One, Galaxy S4 it competes really well, and even scores slightly higher than some of these top 2013 phones, yet it costs less in most markets. If you don’t like bloatware and you prefer speed and fresh software versions including Android 4.4 there is really no other choice, this is the phone for you. Nexus 5 vs Moto G comparison review: Which value smartphone should you buy? The Nexus 5 and Moto G are the best value for money smartphones around at the moment. Those wanting a smartphone to do basic things and aren't so bothered about specifications will do fine with the Moto G while more advanced users will benefit from the hardware on offer from the Nexus 5. Once again, Google has managed to deliver an astonishing package for an unbelievable price tag. The Snapdragon 800 SoC, five-inch 1080p IPS display, LTE connectivity and minimalist yet functional design would all be well suited to a handset nearly twice the price, yet the Nexus 5 brings it all together for just $349. Other flagship smartphones may pack more features in one area or another, but the Nexus 5 shouldn’t be overlooked. Top-end hardware, mid-range price and the stock Google experience is a satisfying combination no matter how you look at it. The Google Nexus 5 is a very powerful 5-inch device that offers a premium Android experience from just about every angle, especially if you're a power user that wants a more performance for gaming, HD video and multitasking. The Nexus 5's build quality is also top-shelf and its display is one of the nicest among the 5-inch devices currently on the market. The handset is average when it comes to battery life. It will typically need charging every night unless you're a light user but wireless charging will help you keep the non-removable battery topped up. The Nexus 5 is a very desirable phone at an outrageously low price. It's the best value-for-money smartphone out there right now but doesn't have the best build, camera or battery life. With Google Now and voice search Android has been utterly invaded by Google’s services and that makes KitKat scarily powerful. More importantly, with an understated build, terrific screen and unflappable performance, the hardware is a worthy match for the glorious Android 4.4 software. While no device bearing the Nexus name has misstepped, with the frenzy around the 5 it’s impressive to say that it lives up to the hype. When we reviewed the Nexus 4 we praised LG for creating a smartphone that took a step back from being overly designed, instead letting it become a window for the main event, Android 4.2 Jelly Bean. Despite that this is without a doubt the best Nexus yet, it’s one of the best Android smartphones available and, in a rather odd twist, it’s probably the best phone LG has made. If we were them we’d be kicking ourselves. The incredible leaps made by Google’s partners this year can’t be overstated. Each manufacturer has come to the table with a thoroughly unique and compelling user experience. Sony, HTC, Samsung, and LG respectively have all done some incredible things this year. An unfortunate result to this explosion of excitement and flair is how absolutely plain that makes the Nexus 5 look right now. Although the issues we take with the Nexus 5 are considerable, they're not enough to keep us from recommending this device. One of the issues we have, which is the lackluster camera, might be resolved with a software fix. And even if it were a minor fix, it's not so bad that you'll never be able to take good photos with it. It may not have the tremendous battery life of the LG G2, or the cameras you'd find in the iPhone 5S or Lumia 1020, or the build quality of the iPhone or HTC One, but you're not going to be sacrificing much with what you're paying for the device. Nexus phones have always been about winning over Android purists who detest software skins and carrier bloatware. That's still the case, but Google has managed to broaden that appeal with the $349 Nexus 5. For significantly less money than competing smartphones, you can walk away with an unlocked LTE handset that packs the fastest processor, a full-HD screen and handy voice-search tools in a slim and light package. Google and LG have done a fantastic job with the Nexus 5, producing a very desirable phone at an outrageously low price. It's the best value-for-money smartphone out there right now. Note: Google is set to launch the Nexus 5X on 29 September. This isn’t the only smartphone that Android will be rolling with this upcoming season, but it’s arguably the best. The Nexus 4 found its way into more than one SlashGear writer’s pocket, and it’s a device that has stood the test of time since launch for many of the same reasons that the Nexus 5 prevails: price, quality hardware, and the promise of software updates direct from Google. The potential for just such an update is, if previous Nexus devices are anything to go by, a possibility we’d bet on. In fact, with at least as much Google software support and community – whether developer, friendly hacker, or accessory maker – support as was given to the Nexus 4, it’s easy to see the Nexus 5 having massive potential for success. It’ll be interesting to see how well the Nexus line continues to compete with the carrier-subsidized smartphone world, but in the off-contract environment, the Nexus 5 simply has no equal. The Nexus 5 is a fantastic smartphone with internal specifications and software that lets it match and at times outperform phones close to double its price. However, there are a few flies in the ointment: issues with its rear camera's autofocus have robbed it of V3's hallowed five-star rating. But even with these minor issues, the Nexus 5 offers terrific value for money and top-end performance, making it the best Android business smartphone currently available. The bottom line on this phone is that it’s very nice, very fast, has a very sensitive touchscreen, and pretty great battery life (we repeatedly clocked more than 9 hours with moderate to heavy use, and more than 12 when using it casually). It’s also a pretty great deal for an unlocked phone at $349 for the 16 GB, and $399 for the 32 GB. The screen is gorgeous. The camera is flawed. The photo processing is fantastic. It’s loaded up with Google brains. And mostly, it does a great job of just disappearing like a good phone should. In absolute terms, the Nexus 5 would earns a “very good” rating, but if you factor in that it costs about half the price of high-end phones, I have to kick it up a notch. The Nexus 5 provides an excellent (pure) Android experience, with the latest features and improvements of Google’s 4.4 OS. To really understand what the Nexus 5 is about, you have to look at it from two angles. That said, there's a simplicity and cleanness to the design that's very appealing, and a definite advantage for developers in that this phone is designed to be fiddled with. It's also very simple to crack open and replace certain parts should they fail. So, after using it for five days would I spend my own money on the Nexus 5? The answer is unequivocally yes; if you don't need the latest and greatest screen and camera and can live without removable storage, there's no better value phone out there. A phone like the Nexus 5 would get our blessing even at a higher price, but the fact that you can buy it for as low as $350 makes it that much sweeter. We can't point our finger at any one feature that was clearly the victim of cost-cutting, with battery life being the only possible exception. The Nexus 5 is an attractive smartphone with an appealing price that will surely persuade many people to pick one up. Though the hardware is fairly mundane, the software will draw attention. Android 4.4 KitKat represents a significant evolution in Google’s OS, and it sets the Nexus 5 apart from the rest of the Android pack. If you’re on a GSM-based carrier such as AT&T or T-Mobile, you should seriously consider making the Nexus 5 your next phone. Battery life could be better and the camera isn't quite as reliable as the best out there – despite being great in some respects. However, these issues seem quite minor given the phone is £100-200 cheaper than the competition. 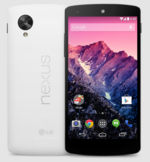 The Google Nexus 5 is the high-end Android phone bargain of the year. Aside from a slightly anaemic battery it offers everything phones costing £200 more do. If you want to buy a SIM free smartphone, then we'd strongly advise you chose the Nexus 5, it's an amazing smartphone with top of the range specs with a ridiculously low price tag. However, if you want to take out a lengthy contract then it really is a closer contest where neither the Nexus 5 of Xperia Z1 will disappoint you. Google Nexus 5 vs Samsung Galaxy S4 comparison review: Does the Nexus 5 stack up against the S4? You simply cannot beat the Nexus 5's price. Sure, the Galaxy S4 has a nicer camera and features expandable memory, but that price, coupled with the new Android OS make the Nexus 5 hard to top. HTC One vs Nexus 5 smartphone comparison review - which great Android phone should you buy? You should buy SIM free, and therefore you should buy the Nexus 5. Both are great handsets, but the Nexus 5 is priced to shift. However, if you are likely to purchase on contract, you have a choice to make between two brilliant Android phones. Either way you'll be happy. From our short time spent with the Nexus 5 it appears as though LG has lost none of that knack, creating a seamless Google experience that feels fresh even if KitKat isn't the overhaul that Apple's iOS 7 might have been. To be truly sure though we'll need to spend more time it, so stay tuned for our full Nexus 5 review. The Nexus range has taken a real step forward here. The Nexus 4 was a great option for those that don't want to spend a lot, but the handset really began to creak after too long. The Nexus 5, while a little later in the year compared to the other top-end handsets, seems to be a lot more bullet-proof in terms of being able to carry on chugging for a couple of years. And what's better is that this will cost very little to buy directly from Google, meaning many will be able to snap this up and go on a rolling SIM-only deal to give freedom to upgrade when they want. The design of the Nexus 5 looks set in stone as press images of the device have appeared - and its looks are entirely in-keeping with what we've already seen. Rather than adopting the LG G2's crazy new rear-mounted controls, it has buttons on its sides – hopefully the internals will remain unchanged. The reason for believing that the Nexus 5 features a fancy MEMS camera is because its camera module number – IMX179 – points to the Digital Optics' MEMS camera unit.However, Droid Life's detective work sadly casts some doubts. The model number is in fact for a Sony sensor, which just happens to be the sensor used in Digital Optic's MEMS system. 0.13 kg: Solo algunos smartphones son más livianos que eso. 90.09%: No existen muchos modelos que sean evaluados mejor. La mayoría de las evaluaciones obtienen resultados que son un poco peores.